As I begin to write this month’s column, I’m starting to wonder if Cycle Sport has any intention of publishing it, or if it’s just a devious ploy by the editor and staff to find out what I/we think of them. It’s time to talk about the relationship between cyclists and the press: sometimes rosy, sometimes tense, and occasionally confrontational. My first memory of anything media-related in my cycling career came when I was 15. I’d finally managed to crack the top three in my age category at the local race, and the following Thursday my name appeared in the local paper. It might have been printed in a tiny font size and camouflaged among a multitude of other local sporting results, but I was pleased as punch and immensely proud. It was a publicly available recognition of an achievement that I’d worked hard for over the previous two years. I’m pretty sure that most cyclists, and sportspeople in general, experience similar feelings after their first brush with the media. We love winning, and the resulting attention from the crowd (if there is one) and press are pleasant by-products. They’re good for the ego. The logical conclusion of this comes when an athlete transcends their sport, becoming so successful that they’re recognised not just by fans but by Joe Public, and becomes a focus for journalists who may have no knowledge whatsoever about their particular discipline. What is happening in their personal lives makes as many headlines as their results, and more is written about them in magazines and online than they’re able to keep tabs on. In cycling, that’s Lance Armstrong, although Mark Cavendish appears to be well on his way. Also Bradley Wiggins. He’s been on the receiving end of some unwanted side-effects of his recently found fame, being pictured post-Olympics in the tabloids having a sneaky (or so he thought) cigarette. Receiving that amount of attention is difficult for riders, who are used to an uninhibited private life, and relative anonymity outside of races. I’ve never come near to reaching those lofty heights, but I have had a lot of experience with the press. I’ve seen firsthand just how many demands the champions of our sport have on them, and how they are misquoted and misinterpreted. I’ve seen how negative comments can affect a rider’s mentality, both positively and negatively. There comes a point in most sporting careers when, having had nothing but positive reports in the media, you receive your first public criticism. I have to admit it’s not easy to read. Nobody likes to be criticised, and especially not to have it in black and white for everyone to read. It can be for any number of perceived faults: from not being visible enough in a race, carrying too much weight, performing under par, or just because a journalist thinks they’ve discovered some tension within a team. Modern social media, and in particular Twitter, has opened us up to criticism from seemingly everyone. It can be a great tool to get your own side of a story across. But on the flip-side, it’s hard to read the comments, sometimes harsh or even abusive, and not take them to heart, even though you have no idea who is writing them. It’s an even more direct form of criticism than internet forums, and significantly harder to hide from. Last year, Greg Henderson posted a tweet indicating that he was leaving Team Sky. Judging by the fact that it was quickly deleted, we can presume it was meant to be a private message, but by that point it was too late. Teams have started to set rules for riders using these media in an attempt to curb controversy and prevent negative publicity. Omega Pharma have implemented a rule preventing riders from tweeting within an hour of crossing the finish line, when tempers can be frayed and adrenalin is at its highest. Once it’s out there, there’s no going back. You will also rarely see riders blaming equipment failure on a bad performance. It happens, but teams understandably don’t take kindly to riders publicly criticising precious sponsors. 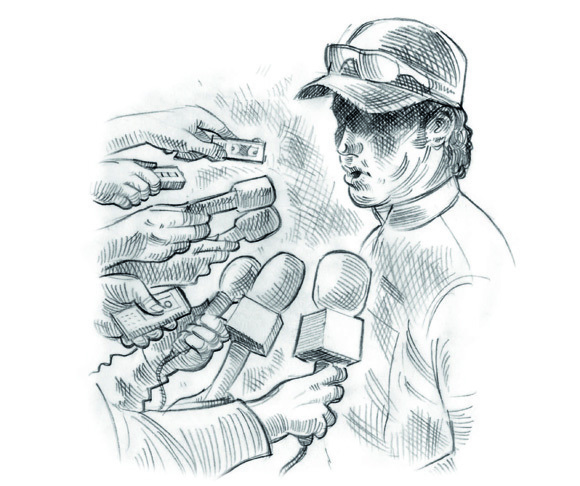 As the sport has become bigger, teams are spending more time teaching riders about media relations: what not to say, how to handle awkward or provocative questions, how to portray the team in a good light, etc. I heard about one team doing a role-play interview in which a rider was asked deliberately challenging questions. He was doing well until a few minutes in when he was asked if he knew where to source performance-enhancing drugs. Judging by the media advisor’s face, his reply, “Well, I guess you can find anything if you do enough research on Google,” wasn’t the answer they were looking for. That’s not the kind of quote you want in a headline with your name in it. Some riders are far more comfortable in the limelight than others. Edvald Boasson Hagen, for example, would obviously much rather just race his bike and not have to deal with the press. On the other hand, some riders bask in the limelight and milk every minute of it, giving long elaborate answers to whoever will listen to them. and more abrupt, as the rider is probably bored of saying the same thing; he wants nothing more than to go back to his hotel. To put things into perspective, the yellow jersey at the Tour is interviewed by two or three of the head journalists from television, sometimes in different languages, then faces a few short interviews for other television and radio, then heads to a press conference with the written and online press, before finally being set free. Bearing this burden of interviews is the rider’s obligation; dare to skip one and he will be reprimanded by ASO. Generally, things go pretty smoothly. Many in the press are familiar faces covering races all season long. This can pose a problem in itself — at what point does a friendly chat become a full-blown interview? For the most part, journalists want to keep a good relationship with the riders, and won’t print anything that is obviously meant to be private. Even so, as a rider I’ve learned to be careful to define what’s on-the-record and what’s off; otherwise, the juicy gossip shared over a beer all too easily turns into the next big story. At higher-profile races, and in particular in the Tour, a new problem crops up. Journalists who don’t specialise in cycling arrive on the scene with a basic but far from in-depth knowledge of the sport. Some of their questions are either irrelevant or completely patronising, so it can be hard to remain buoyant and enthusiastic. I was training in Italy this year during the first week of the Giro d’Italia, and so I caught the local coverage in the late afternoons. After watching Mark Cavendish take a hard-fought sprint ahead of Matt Goss, the Radiotelevisione Italiana interviewer asked him how it felt to win in front of his girlfriend and son, who were visiting the race. The instant reply was “It’s not my f***ing son, it’s my daughter. Do you wanna start again?” The only trouble for the journalist was that he couldn’t — it was live.